Preheat a non-stick pan on medium heat and coat with cooking spray. Fry ham slice for 1 minute on each side until warmed and slightly browned. Set aside. Saute kale until wilted. Add garlic and cook until fragrant, approx 2 minutes. Add eggs to the kale mixture and stir to combine. Let cook until mostly set. 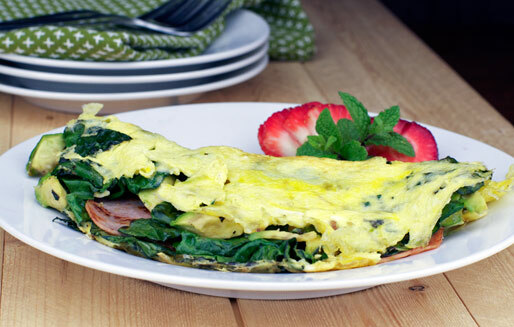 Add chopped avocado to once side of the omelette then top with ham slice. Season with salt and pepper. Gently fold omeltte in half and reduce heat to low to allow the omelette to finish cooking. Slide off the skillet and onto a plate to serve. Top with tomatillo salsa and shredded cheese if desired. For a spicier kick, add chopped jalapeno pepper to the kale as it sautes. Recipe number 3166. Submitted 3/10/2013.